Could be freezing cold when you least expected it. We had a couple of water beds (full motion, no baffles). Got rid of the last one in the early 90s. They were getting harder to up out of in the morning. Man, sometimes getting older stinks! Oh well. I had a couple of these. I loved each and every one. Light. Storage compartments, no box springs - just a hassle to move. 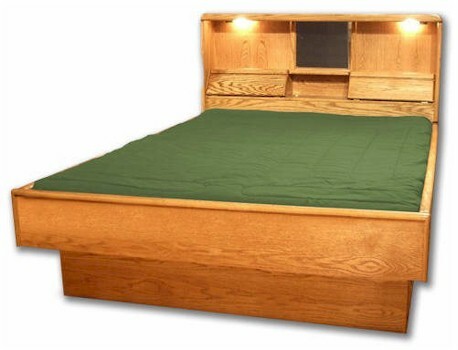 A friend of mine had one of these in her apartment in 2000.
true, I was the first one to bring waterbeds from La to Vegas, the original ones, basically a plastic bag, many sizes from King, round, twin...later in Hawaii, there was a frame, still later, the ones with baffles, then the ones pictured, still a good idea, but be sure your floor can take the weight....I was in a round one in a wooden house perched on a hillside in Echo Park when the first LA quake hit, the creaking of all the wood was so loud...thought the house was on fire, but it was just the chimney soot...the aftershock a day or two later was almost as strong, you never know if it's going to get more extreme or lass, been in several since, my son just barely cleard the one in San Francisco around '89 when the highway collapsed,last one was the Spring Break Quake inOregon, was on the phone with a friend inPortland, she was telling me it had started, and it took several minutes for it to get to me on the coast! balancing on the edge to put your shoes on in the morning resulted in a sore behind! I had one just like this for a while in the late '70s.